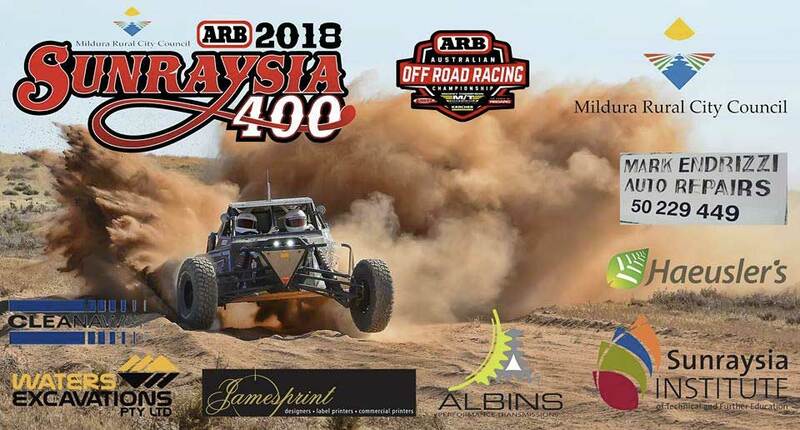 The ARB Australian Off Road Racing Championship season is ramping up with the second round, the Mildura Rural City Council ARB Sunraysia 400, just over two weeks away. Discounted entries for the Mildura Rural City Council ARB Sunraysia 400 close at midnight Friday 6th April with premium entries open for another week. With a change in format and shortened 60km course through the Keera Station farmlands, the Sunraysia Motor Sport Club have been out in force preparing for the 20-22 April event. Keera Station has been a hive of activity with the track marking teams out in force. Now is also an ideal time to remind competitors, spectators and anyone attending the Sunraysia 400 that Keera Station is a working station, therefore strict NO DOGS and NO GLASS rules will be in place; please assist the organisers in policing this. Full catering, bar and amenities will be available throughout the weekend with dinner tickets for Saturday night available for purchase with your entry.